Inflammation clearly plays a clinically significant role in the development of CVD. Consequently, as a marker of inflammation, hsCRP has been studied extensively in patients with CVD. The predictive value of hsCRP has been widely investigated but the results are contradictive. More than 20 large prospective trials have shown that hsCRP is an independent predictor of future cardiovascular events (Ridker, 2007). In the most recent comprehensive meta-analysis studies of cardiovascular risk factors (more than 50 prospective studies with over 160,000 participants, none of them with a history of coronary heart disease or stroke) (Kaptoge et al., 2010), hsCRP was consistently found to be an independent predictor of CVD. However, the association with ischemic vascular disease depends considerably on conventional risk factors and other markers of inflammation. A critical review by Levinson and colleagues argues that hsCRP is poor discrimination over a wide range of values when used in conjunction with risk factors for lipoprotein lipids, hypertension, metabolic syndrome, and diabetes (Levinson et al., 2004). Danesh and colleagues published a study, performed in a high-risk population with nonfatal myocardial infarct, which questioned the role of CRP in the assessment of cardiovascular risk. However, hsCRP maintained a predictive value after adjustments for smoking and hypertension (Danesh et al., 2004). A panel of multiple biomarkers, 10 biomarkers in total including hsCRP, was used for prediction of death and major cardiovascular event in more than 3000 participants of the Framingham Off-spring study followed for 10 years (Wang et al., 2006). As a single marker, hsCRP predicted risk of death but no major cardiovascular events after adjusting for other biomarkers, and individuals with high multimarker scores had almost 4 times as great a risk of death. Nonetheless, the authors concluded that the use of contemporary biomarkers adds only moderately to standard risk factors. In the Women’s Health Study, CRP was found to be additive to LDL-cholesterol in predicting future CVD in healthy American women (n=28,263 apparently healthy postmenopausal women) (Ridker et al., 2000a). Of the 12 markers measured (including hsCRP and IL-6), hs-CRP was the strongest uni-variant predictor of cardiovascular events, and the only plasma marker predicting risk after adjustment in a multi-variant analysis. This was confirmed in a large meta-analysis of hsCRP as a single biomarker in patients with stable CAD, but the authors concluded that a routine measurement of CRP should not be recommended as a single prognostic biomarker (Hemingway et al., 2010). However, in combination with other biomarkers, hsCRP seems to add significant information to traditional risk factors for CVD, and the value of adding hsCRP to standard risk equations was noted in separate cohorts of asymptomatic (middle-aged or elderly) men and women (Lavie et al., 2009b). In the Caerphilly Prospective Heart Disease Study, Mendall and colleagues, showed a significant and positive association between CRP and incidents of IHD, not affected by ischemia history (Mendall et al., 2000). However, after adjustment of lifestyle risk factors (such as smoking and obesity) only the association with all-cause mortality remained significant. Plasma hsCRP was not found as an independent predictor of long-term IHD risk in a 13-year-follow-up study of men with no previous history of IHD (n=1982) (St-Pierre et al., 2005). The authors thus concluded that neither CRP nor the systemic inflammation appeared to have a direct role in the development of IHD. But the association of hsCRP with IHD may be that CRP levels are raised non-specifically by a variety of exposures that are themselves implicated in the pathogenesis of IHD (Figure 2). A connection between CRP and activation of the complement system was proposed more than 35 years ago, after the discovery of aggregated or ligand-complexed human CRP was able to bind to C1q and activate the classical pathway (Kaplan and Volanakis, 1974; Siegel et al., 1974; Jiang et al., 1991), thus mediating the functions summarized in Figure 1. CRP was later found to co-localize with activated complement fragments in atherosclerotic lesions (Bhakdi et al., 1999; Yasojima et al., 2001) and CRP-mediated complement activation in the arterial wall may be considered as an important pathogenic feature in CVD. Fig. 2. 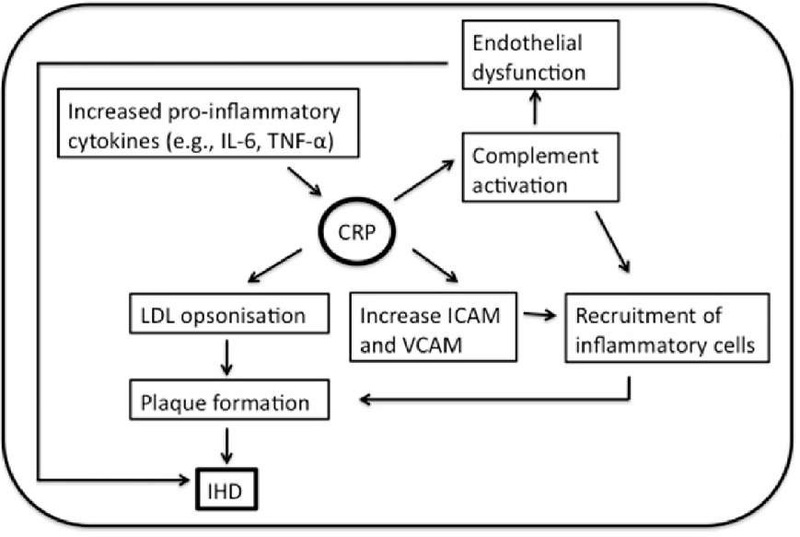 Schematic depiction of potential mechanisms of CRP involvement in the pathogenesis of IHD. A number of pro-inflammatory cytokines have been shown to play roles in the process leading to IHD, but IL-6, in particular, appears to have a central role, e.g. by stimulating the liver to increase the CRP production. However, even with a strong correlation between IL-6 and CRP, IL-6 was found to predict future AMI in a group of apparently healthy men (Ridker et al., 2000b). CRP binds to apolipoprotein-containing lipoproteins like LDL (de Beer et al., 1982) and very low-density lipoprotein (VLDL) (Rowe et al., 1984), which may be of considerable importance in the pathogenesis of CVD. More recent studies revealed that CRP preferentially binds to modified forms of LDL; enzymatically modified LDL (Bhakdi et al., 1999) and oxidized LDL (Chang et al., 2002), and CRP was reported to mediate LDL uptake by macrophages (Zwaka et al., 2001). Opsonisation of LDL lead to monocyte infiltration and the formation of foam cells resulting in plaque formation and eventually IHD. CRP was found to cause expression of cell adhesion molecules with a significant dose-dependent expression of ICAM-1, VCAM-1 and E-selectin in human umbilical vein endothelial cells (HUVEC) following CRP stimulation (Pasceri et al., 2000). Furthermore, production of chemokines monocyte chemoattractant protein-1 (MCP-1), which plays an important role in recruitment of monocytes into the vessel wall and thus the formation of plaques, was directly induced by CRP (Pasceri et al., 2001). Is CRP a potential therapeutic in prevention of IHD? As described in the previous section, CRP is reported to be associated with a wide range of biomarkers and risk factors of IHD. Thus, overestimating of the true effect of hsCRP on CVD risk, because of confounding effects, constitute a challenge. Support for a role of CRP in the pathogenesis of CVD comes primary from epidemiologic studies, which in general have observed an association between elevated plasma CRP and cardiovascular events. Although hsCRP may not be the ideal marker of IHD, it seems to be very reliable, and hsCRP is a simple, non-invasive, commercially available, inexpensive and reproducible biomarker. CRP measurement has a lot of advantages; the protein is stable and the concentration is not subjected to time-of-the day variations (Meier-Ewert et al., 2001). Thus, determination of baseline hsCRP for cardiovascular risk prediction may be performed without concern for diurnal variation. Availability of drugs to block CRP binding and its effects in vivo would provide a powerful tool for determining whether CRP is just a marker or does indeed participate in the pathogenesis of CVD complications. Griselli and colleagues (Griselli et al., 1999) showed that injection of human CRP in a rat model of AMI enhanced the infarct size, of note rat CRP does not activate rat complement, whereas human CRP activate both rat and human complement. However, in vivo complement depletion, by cobra venom factor, completely abrogated this. A similar effect was later found by administration of a specific synthetic CRP-inhibitor, 1,6-bis(phosphocholine)-hexane, which reduced the infarct size and thus provided promising results for therapeutic inhibition of CRP (Pepys et al., 2006). Statins lower the levels of LDL-cholesterol and CRP. Ridker and colleagues showed, in a sub-population (n= 3745) derived from the Pravastatin or Atorvastatin Evaluation and Infection Therapy-Thrombolysis in Myocardial Infarction 22 (PROVE IT-TIMI 22) study, that patients with low hsCRP levels after statin treatment had improved cardiovascular outcome (Ridker et al., 2005). Patients in whom statin therapy resulted in hsCRP levels below 2 mg/L overall had better clinical outcomes regardless of the LDL-cholesterol level achieved. Recently, a study JUPITER: Justification for the Use of Statins in Prevention: an Intervention Trial Evaluating Rosuvastatin (n=17802), of healthy individuals without history of CVD but hsCRP > 2 mg/L and low LDL concentration, showed beneficial effect of Rosuvastatin (Ridker et al., 2007; Kones, 2010; Ridker et al., 2010). The study was terminated due to a great risk-reduction in AMI, CVD and death from cardiovascular causes, indicating that part of the statin effect may be mediated through lowering CRP. Aside from whether measurement of CRP is useful in assessments of CVD, studies are needed to help determine if CRP is a mediator or a marker of CVD. Zacho et al. showed that genetic variants that are associated with a lifelong increased plasma CRP level are not associated with increased risk of IHD (Zacho et al., 2008), indicating CRP as a marker but not as an actual contributor. The involvement of polymorphonuclear neutrophils (PMNs) in the pathogenesis of CVD has received relatively little attention, despite their presence in the atherosclerotic plaques (Quinn et al., 2008). PMN counts have been reported as independent risk factors for cardiovascular outcome (Madjid et al., 2004) and during inflammation PMNs are activated in order to enhance the inflammatory response and releases antimicrobial peptides into circulation. Anti-microbial peptides are polypeptides of fewer than 100 amino acids. The human innate immune system includes two main families; defensins and cathelicidins. Defensins, also termed human neutrophil peptides (HNP) as they are found in large amounts in neutrophils, are secreted during phagocytosis as a first line of defence against invading organisms (Ganz, 2003). Three different classes of defensin are identified in mammals, two of which are found in humans; a- and P-defensin (Ganz, 1987). The human family of a-defensins are composed of 3 closely related gene products, also referred to as human neutrophil peptides 1-3 (HNPs-1-3) and HNP4, HNP5 and HNP6. The a-defensins are cationic peptides, cysteine-rich peptides of approximately 3 kDa and are normally sequestered in the granules of neutrophils, where they constitute 5% of the total cellular protein and are involved in the intracellular killing of prokaryotic organisms (Ganz, 1987). Under normal conditions, only small amounts of a-defensins (nanomolar range) are found in plasma. However, during inflammatory reactions, a-defensins are released extracellularly, which could exert harmful effects on host cells. Increased plasma concentrations of a-defensins have been described in several inflammatory diseases (Ganz, 2003; Klotman and Chang, 2006; de Leeuw and Lu, 2007). The cationic nature of the a-defensins prefers the negatively charged phospholipids of the bacterial membrane as target and avoids the more neutral charged mammalian cell membrane. However, both a direct and an indirect chemoattracting role of a-defensins has been reported for a number of cells (Oppenheim et al., 2003). In addition, a-defensin was found to promote oxidative stress and induces endothelial dysfunction by reducing the endothelium-dependent relaxation in porcine coronary arteries (Kougias et al., 2006). This effect is associated with increased superoxide radical production and decreased eNOS expression. Also, a-defensins is capable of forming complexes with C1q and MBL, thus playing a role in the regulation of both the classical and the lectin pathway of complement activation (Groeneveld et al., 2007). Localization of a-defensins were analysed by the use of immunohistochemical staining of coronary arteries from patients with severe CVD or normal donor heart tissue (Barnathan et al., 1997). Of interest, a-defensin was found most prominently in association with intima smooth muscle cells of both normal or atherosclerotic vessels. a-defensins has been reported as an atherogenic agent by enhancing and promoting stable complexes with LDL particles, thus stimulating the binding to endothelial and smooth muscle cells (Higazi et al., 1997). In addition, in human cerebral vessels obtained during autopsy, a-defensin and LDL co-localized primary within the atherosclerotic areas, and the staining intensity correlated with the severity of the disease. The authors hypothesize that the small a-defensins may rapidly cross the endothelial barrier and gain access to sub-endothelial matrix and affording the binding of LDL and a complex relative resistant to degradation. Retention of LDL in the arteries may predispose to pro-atherogenic modifications, such as, oxidation and internalization by foam cells. In addition, an independent negative relationship between high-density lipoprotein (HDL) has later been described (Saraheimo et al., 2008). Furthermore, a-defensins were found to inhibit the fibrionolytic activity by binding to tissue plasminogen activator molecule (Kougias et al., 2005). In a small study of patients undergoing elective coronary artery catheterization, an accumulation of a-defensin in the human skin was described and the accumulated amount correlated with the severity of coronary artery disease (Nassar et al., 2007). Of note, no correlation between CRP and a-defensin was found in this study. Chronic low-grade inflammation is a hallmark of obesity and diabetes, and has been causally linked to the development of premature CVD. In a group of type-1 diabetic patients, with a 10-year-follow-up-period of cardiovascular end-points, elevated baseline plasma a-defensin levels were an independent predictor for cardiovascular morbidity and mortality (Joseph et al., 2008). In a recent study, the risk of cardiovascular mortality was significantly increased with elevated plasma a-defensin levels in patients admitted for elective lower extremity artery surgery (Urbonaviciene et al., 2011). Surprisingly, patients with high a-defensin levels combined with high hs-CRP levels had a five time increased risk of cardiovascular death compared to patients in whom only one or none of the peptides was elevated. Inflammatory biomarkers may have prognostic value for future cardiovascular risk stratification among individuals with high risk or a history of IHD, but they may also in particular be useful in apparently healthy individuals who might be at higher risk than estimated by the traditional risk factor scores. Using a biomarker profile that covers various aspects of the complex pathophysiology of IHD may increase the rational basis for cardiovascular risk assessment. As decribed above, a multiple inflammatory role of the combination of complement activation, CRP, LDL and a-defensins may participate in the pathogenesis of IHD and other CVD. With the emergence of novel biomarkers for inflammation and vascular damage it may be possible to characterize different contributions of each of these major mechanisms to short-and long-term prognosis following CVD. Hopefully, patients may benefit from different therapeutic strategies depending on their personal biomarker profile in the future. So far, however, results about which biomarkers are the most suitable for diagnosis or prognosis of IHD remain conflicting, and further research within this field is needed.